VATICAN CITY, Oct 24 (Reuters) – – Pope Benedict called on Monday for sweeping reforms of the world economy and the creation of a ethical, global authority to regulate financial markets as demonstrations against corporate greed continued to spring up in major cities across the globe. 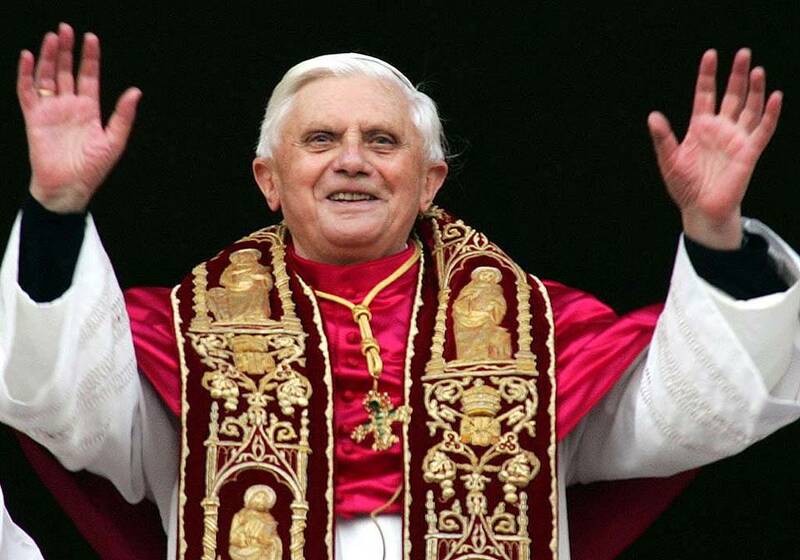 “Caritas in Veritate,” or “Charity in Truth,” is Benedict’s third encyclical since he became pope in 2005. He said the financial downturn had revealed behaviours like “selfishness, collective greed and hoarding of goods on a great scale,” adding that world economics needed an “ethic of solidarity” among rich and poor nations. The Vatican called for the establishment of “a supranational authority” and a “true world political authority” with worldwide scope and “universal jurisdiction” to guide economic policies and decisions and work for the common good. Such an authority should start with the United Nations as its reference point but later become independent and be endowed with the power to see to it that developed countries were not allowed to wield “excessive power over the weaker countries”. This startling announcement brought back to my mind teaching I heard in the late 60’s that the Pope was the Antichrist. Then I started thinking “ What if this idea gets traction, and the Pope succeeds in getting the world leaders together to put this plan into action. Then some of what is written in the Book of Revelations would make perfect sense. Revelation 13:17 (ESV) so that no one can buy or sell unless he has the mark, that is, the name of the beast or the number of its name. How easy would this be if we have only one world bank and money? Many teach that the Antichrist will come from ‘Babylon’. Revelation 17 says he will carry Babylon, but then he will carry out its destruction. I can see the world’s financial collapse leading to such a plan as the Pope is proposing. One of the great supporters of it will be the Antichrist. But after the plan is in place and he comes to power, he will turn on the religious power of Babylon, destroying it (Rev 17) and then turn on the political power of Babylon (Rev 18). This is because all power will belong to him! I. What Does Babylon Represent in Scripture? To understand Babylon, we need to go way back, to the time just after the Great Flood. As we examine Babylon’s place in history, we will find that it represents the Best that Man can do and be. Babylon is man exalting himself to God, and even above God. 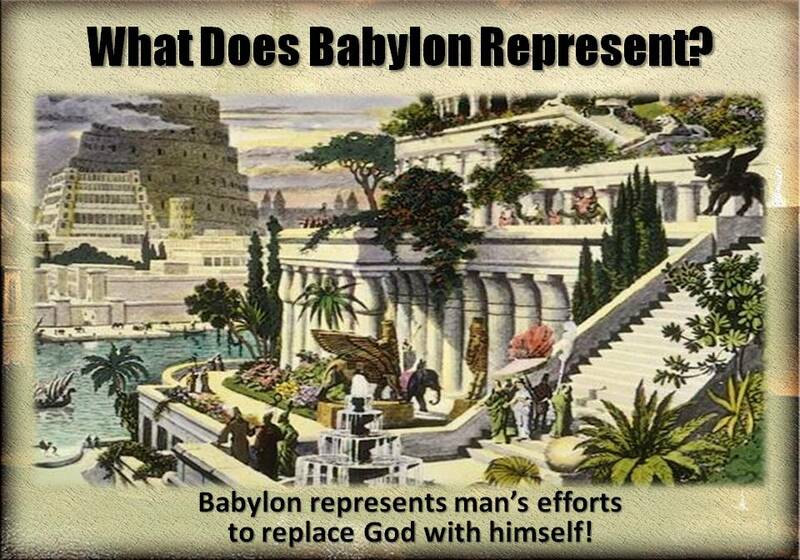 Babylon represents man’s efforts to replace God with himself! The First Corporate Sin that Manifested itself after the Flood took place on the planes of Shinar, the sight of Babylon. Here a mighty ruler named Nimrod built a tower that reached to the heavens. Genesis 10:8-10 (NIV) Cush was the father of Nimrod, who grew to be a mighty warrior on the earth. He was a mighty hunter before the Lord; that is why it is said, “Like Nimrod, a mighty hunter before the Lord.” The first centers of his kingdom were Babylon, Erech, Akkad and Calneh, in Shinar. The Sin of Nimrod and his subjects was seeking to Minimize God’s place in their lives. They were seeking to exalt themselves above God. They were seeking to take God out of their lives. They were also seeking a guarantee that God could never destroy them by a flood again. They would simply go into their ‘tower’ of escape! 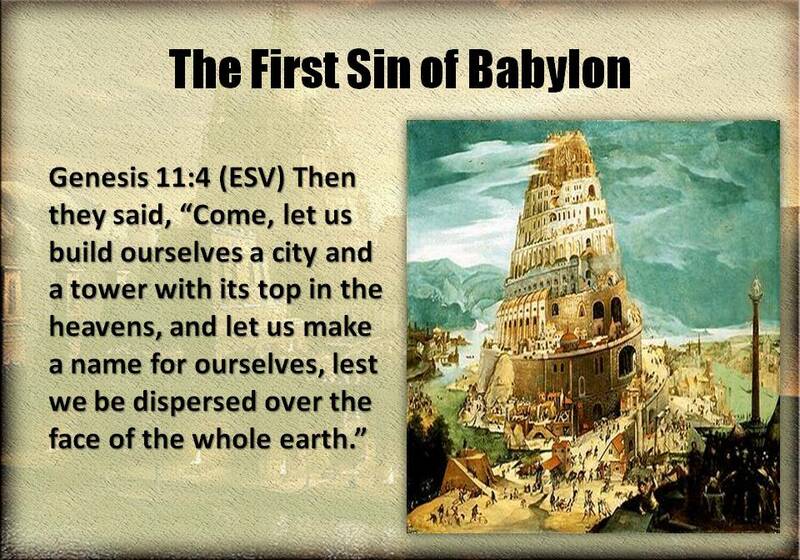 Babylon represents Man’s efforts to MINIMIZE God. They wanted a God whom they could control. The attitudes revealed in their actions indicate how they sought to accomplish this. What we glory in reveals the god(s) of our lives. Man wanted to make a name for himself, through the work of his hands. He wanted recognition for what he could accomplish. So man built a tower on the plains of Shinar, at Babylon. The very first place in the post-flood world that man exalted himself above God was at Babylon. 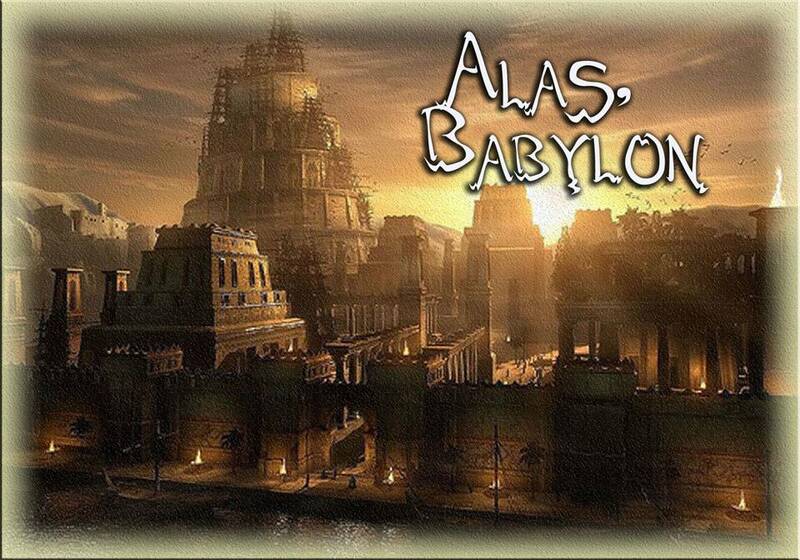 Indeed Babylon became a symbol for the greatness of man! This desire to rob God of His glory is so entrenched in mankind, that no matter what God does to mankind in the tribulation, mankind will curse God and refuse to repent and give Him glory! Revelation 16:8-9 (ESV) The fourth angel poured out his bowl on the sun, and it was allowed to scorch people with fire. They were scorched by the fierce heat, and they cursed the name of God who had power over these plagues. They did not repent and give him glory. Psalms 2:1-4 (NIV) Why do the nations conspire and the peoples plot in vain? The kings of the earth take their stand and the rulers gather together against the Lord and against his Anointed One. “Let us break their chains,” they say, “and throw off their fetters.” The One enthroned in heaven laughs; the Lord scoffs at them. Genesis 11:6 (ESV) And the Lord said, “Behold, they are one people, and they have all one language, and this is only the beginning of what they will do. And nothing that they propose to do will now be impossible for them. Where Does Man Get this desire to rob glory from God? We all know what happened to Lucifer: Luke 10:18 (ESV) And he said to them, “I saw Satan fall like lightning from heaven”. 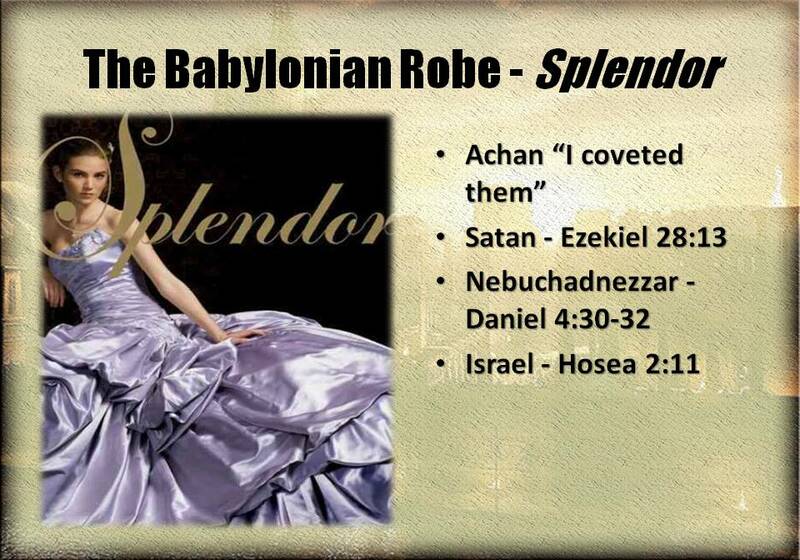 The first Sin that spoiled the Promised Land for the Jews was the pride of wearing a Babylonian Garment. 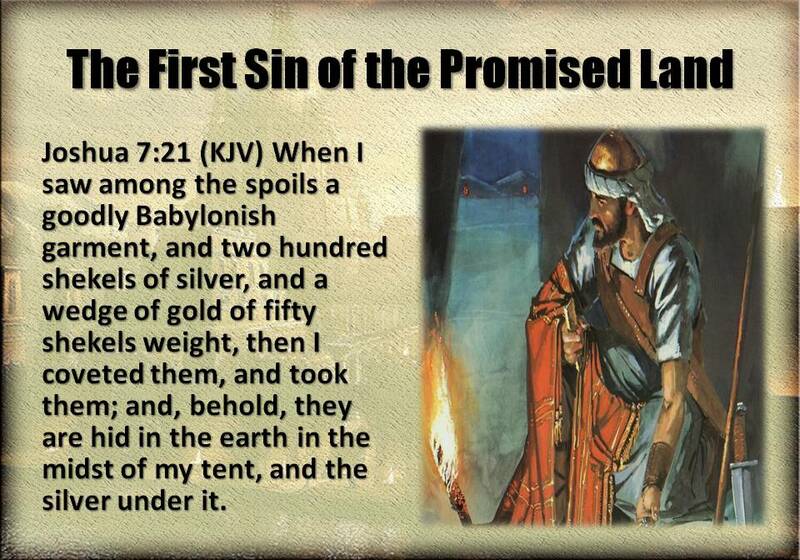 Joshua 7:21 (KJV) When I saw among the spoils a goodly Babylonish garment, and two hundred shekels of silver, and a wedge of gold of fifty shekels weight, then I coveted them, and took them; and, behold, they are hid in the earth in the midst of my tent, and the silver under it. Jericho, an evil city, full of evil inhabitants, so evil that Lindey Lohan could have been a priestess, was dedicated to God for destruction. It was so evil that everyone in it was to be destroyed like Sodom and Gomorrah. The silver and gold, and every vessel of bronze and iron was to be given to the treasury of God. Achan cheered at Joshua’s decree. Yeah! Everything is wicked! We’ll destroy it all! But there he was, checking out the spoil of one of his victims, and his eye was attracted to this snazzy Babylonian garment. The material was so soft, the design was so intricate. The beading and jewels adorning the garment took your breath away. This garment took a year to sew. He had seen something almost as nice in the latest issue of Babylonia Today! If his friends would see him wearing such a garment, they would be so jealous! He could go anywhere in the Kingdom wearing such a garment. It was fit for a King! Actually, that garment was fit for destruction. It represented Man’s Pride in his accomplishments, accomplishments made apart from God! Achan was seduced and brought trouble upon Israel: “then I coveted them and took them”. The life of Achan ended in a heap of stones. Joshua 7:25-26 (ESV) And Joshua said, “Why did you bring trouble on us? The Lord brings trouble on you today.” And all Israel stoned him with stones. They burned them with fire and stoned them with stones. And they raised over him a great heap of stones that remains to this day. Then the Lord turned from his burning anger. Therefore, to this day the name of that place is called the Valley of Achor. 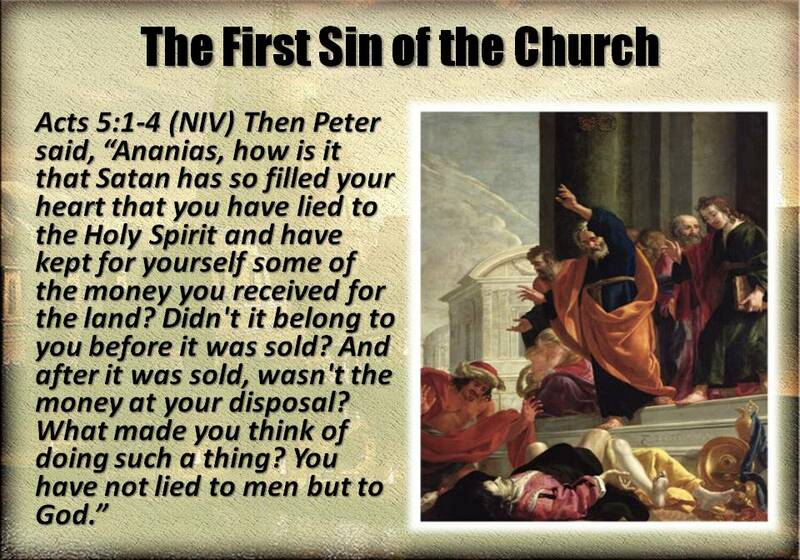 Ananias, in lying to the church, embraced all the sins of Babylon. He wanted the splendor that the money could by him. He wanted to status of appearing to be such a giving saint. He wanted to appear successful in the eyes of the church and his friends. Satan filled his heart with the spirit of Babylon. Ananias tried to minimize God, and exalt himself. God had the last laugh once again. D. What is the Danger of Babylon? Yet their small act of sin represented a danger to what God wanted to accomplish. 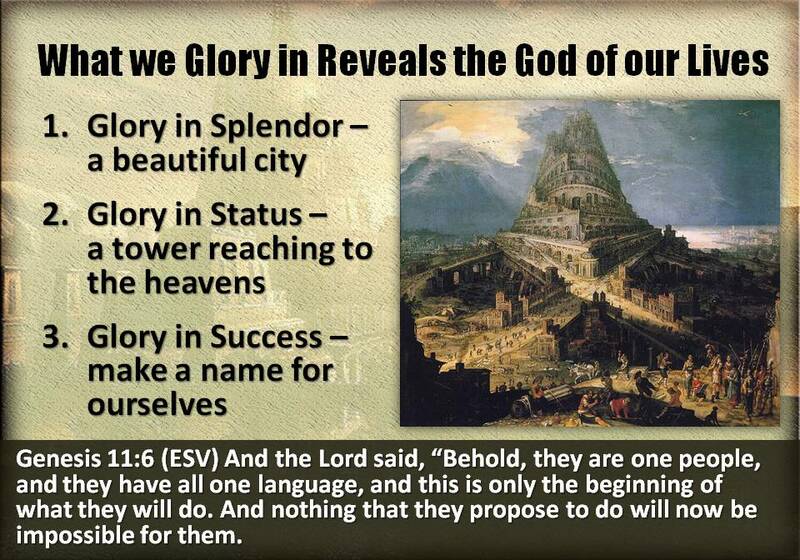 Nimrod looked at the Tower of Babel reaching to the sky and said, wow, look what we did! God saw the Tower and changed the course of Mankind! Achan looked at the Shiny Robe and said, Wow wouldn’t I look like somebody in the Robe? What is so dangerous about Babylon? What dangers was God wanting to protect His people from? 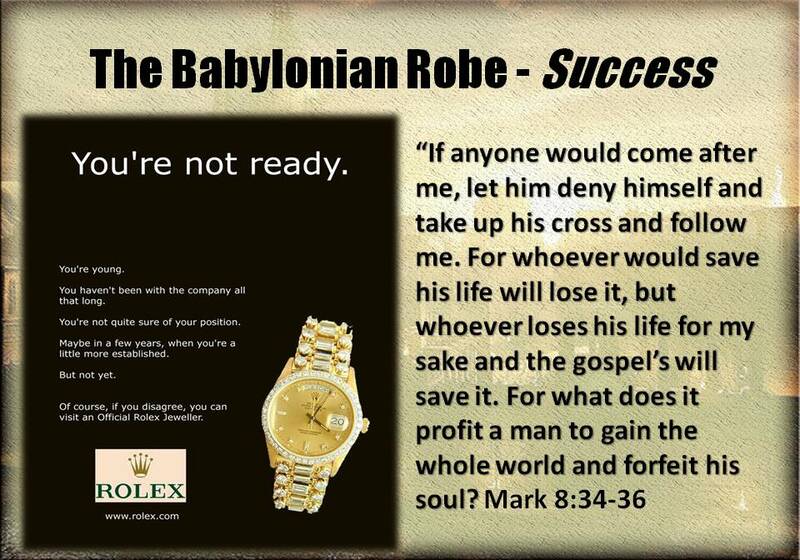 The Best Way to understand the danger of Babylon is to understand what the Babylonian Garment represented. This garment pictures Babylon far better than the silver or gold that Achan also took. That is why it was mentioned. This Babylonian Garment represents Three Things that are a Danger to our love for God. They are seemingly innocent things, things that we all need and appreciate and even desire. But the Seduction of these three things will work their way into our lives until they minimize our need for God. We all appreciate beauty. We are drawn to it. Whether it is a car, a woman, even a horse, we love beautiful things. Advertisements shout this loud and clear. Television shows, even reality TV shows, shout this. Women (and men) spend billions of dollars to make themselves beautiful. Architects design buildings, even stadiums, to display the splendor and beauty of their imagination. King Ahasuerus, reigned from India to Ethiopia, and in the third year of his reign, he gave a feast for all of his officials and servants and nobles and governors that lasted 180 days. All the days of the feast he displayed the riches of his royal glory and the splendor and pomp of his greatness. We love to display our splendor and glory-whether in our clothes, our car, our home, our possessions. America is a land of BLING! We even do it with teeth fillings, piercings and tattoos! We trick out our trucks, our cars, our motorcycles, we wear our jewelry and accessorize! a) Even Satan was all about BLING! According to Ezekiel 28:13, a probable reference to Lucifer, we learn that he is an amazing being to behold: “You were the seal of perfection, full of wisdom and perfect in beauty. You were in Eden, the garden of God; every precious stone was your covering: the sardius, topaz, and diamond, beryl, onyx, and jasper, sapphire, turquoise, and emerald with gold. The workmanship of your timbrels and pipes was prepared for you on the day you were created”. Splendor is seductive. It lured Lucifer into rebellion. It lured David into deep sin. It lured the wisest man on the earth into committing unspeakable acts against his God, whose very wisdom he possessed. Hosea 2:11-13 I will stop all her celebrations: her yearly festivals, her New Moons, her Sabbath days –all her appointed feasts. I will ruin her vines and her fig trees, which she said were her pay from her lovers; I will make them a thicket, and wild animals will devour them. I will punish her for the days she burned incense to the Baals; she decked herself with rings and jewelry, and went after her lovers, but me she forgot,” declares the LORD. 1Pet. 3:1 Wives, in the same way be submissive to your husbands so that, if any of them do not believe the word, they may be won over without words by the behavior of their wives, 2when they see the purity and reverence of your lives. 3Your beauty should not come from outward adornment, such as braided hair and the wearing of gold jewelry and fine clothes. 4Instead, it should be that of your inner self, the unfading beauty of a gentle and quiet spirit, which is of great worth in God’s sight. 5For this is the way the holy women of the past who put their hope in God used to make themselves beautiful. Psalms 96:9 (ESV) Worship the Lord in the splendor of holiness; tremble before him, all the earth! Psalms 111:3 (ESV) Full of splendor and majesty is his work, and his righteousness endures forever. 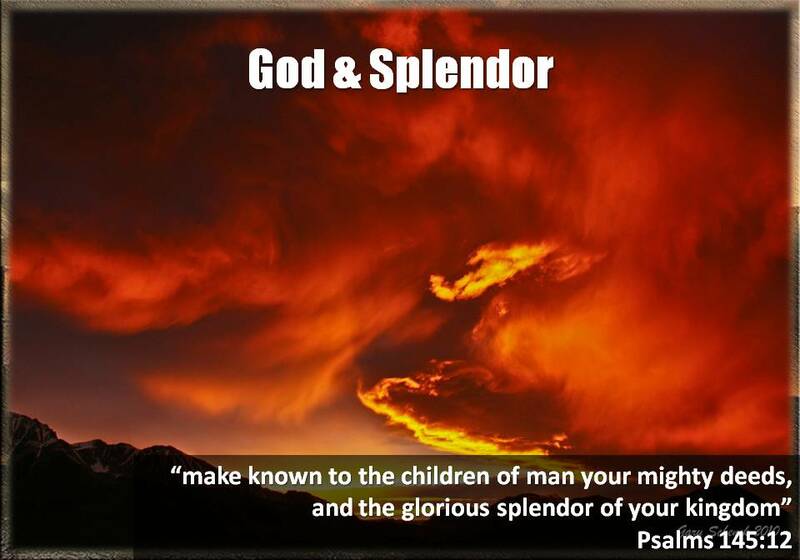 Psalms 145:12 (ESV) to make known to the children of man your mighty deeds, and the glorious splendor of your kingdom. 5. In the End Times, Men will seek to hide from the splendor of God! Isaiah 2:19 (ESV) And people shall enter the caves of the rocks and the holes of the ground, from before the terror of the Lord, and from the splendor of his majesty, when he rises to terrify the earth. Isaiah 13:19 (ESV) And Babylon, the glory of kingdoms, the splendor and pomp of the Chaldeans, will be like Sodom and Gomorrah when God overthrew them. Ephesians 5:25-27 (ESV) Husbands, love your wives, as Christ loved the church and gave himself up for her, that he might sanctify her, having cleansed her by the washing of water with the word, so that he might present the church to himself in splendor, without spot or wrinkle or any such thing, that she might be holy and without blemish. Tradition has it that this robe was a priestly robe, used in worship to the Canaanite gods. This robe not only was beautiful, it represented power. It represented standing. It represented status. Whoever wore this robe was always on the “A-List” party invitations. This robe granted its wearer access to the power people of Jericho and Canaan. The wearer was somebody. Nobody messed with whoever wore this robe. If they did, they found themselves being sacrificed to Baal! Status is very important in our world. Satan began it all by saying “I will be as the most high”. He wanted the status of God himself. Adam and Eve ate the forbidden fruit because they wanted to be like gods. Lot chose the well watered plains of Sodom and Gomorrah, and instead of hating the sin, he became enmeshed in it, even becoming a man of ‘status’ a judge at the gate. Judas followed Jesus for the status he thought it would bring him. When it became apparent that Jesus was not going to become King, he set out to betray the Son of God! Aaron and the Levites set out to worship God in the Tabernacle. But by the time of Christ, the High Priest had become a perverted, corrupt institution motivated by power and status. Ministry today is often corrupted by a pursuit of ratings and donations and status. Pastors focus their efforts on the Four “B’s” – Building Size, Budget Size, Number of Baptisms, and Number of Bodies. Spiritual growth and Character growth are not emphasized, because they do not build the churches ‘status’ as far as the world is concerned. Focus upon STATUS is PRIDE! Nothing says success like Excess. Or a Rolex, Cadillac, or ___________. You name it, we’ll wear it or drive it as long as it makes us look successful! I can just see Achan trying on that shiny robe. Oooh he felt so good. He couldn’t wait to be seen wearing it. Everyone would be jealous of his apparent success! Daniel 4:4 (ESV) I, Nebuchadnezzar, was at ease in my house and prospering in my palace. Look at America. We are swimming in debt, but we still consume and charge and buy our way into success. Just a few months ago the politicians were encouraging us to consume more to get this economy going. We trade our souls for stuff. Stuff to show our success. Stuff to make us feel secure at night. Possessions, Money, those are things we can rely on. Our future is secure if we have money. We don’t have to worry about growing old, or caring for our loved ones, if we have money in the bank. Mark 8:34-36 (ESV) And calling the crowd to him with his disciples, he said to them, “If anyone would come after me, let him deny himself and take up his cross and follow me. For whoever would save his life will lose it, but whoever loses his life for my sake and the gospel’s will save it. For what does it profit a man to gain the whole world and forfeit his soul? Revelation 3:17 (ESV) For you say, I am rich, I have prospered, and I need nothing, not realizing that you are wretched, pitiable, poor, blind, and naked. Joshua 1:8 (ESV) This Book of the Law shall not depart from your mouth, but you shall meditate on it day and night, so that you may be careful to do according to all that is written in it. For then you will make your way prosperous, and then you will have good success. 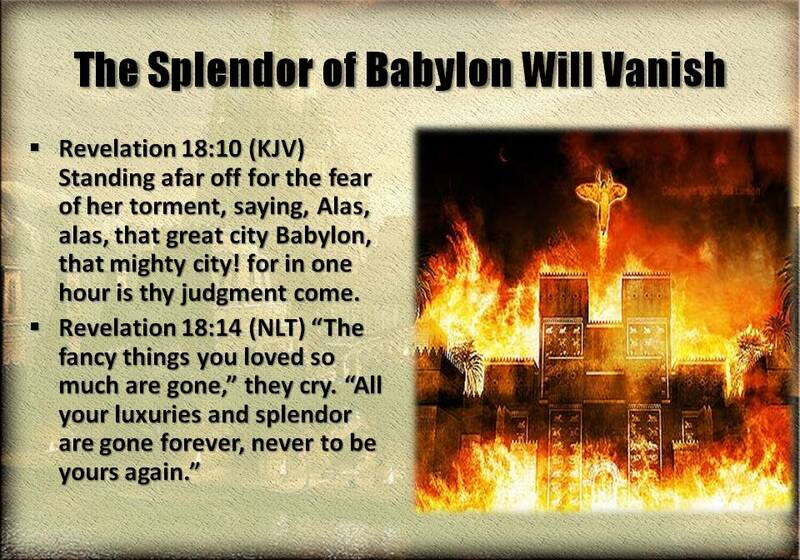 Revelation 18:10 (KJV) Standing afar off for the fear of her torment, saying, Alas, alas, that great city Babylon, that mighty city! for in one hour is thy judgment come. When Babylon Falls, there will be the greatest Hallelujah ever! 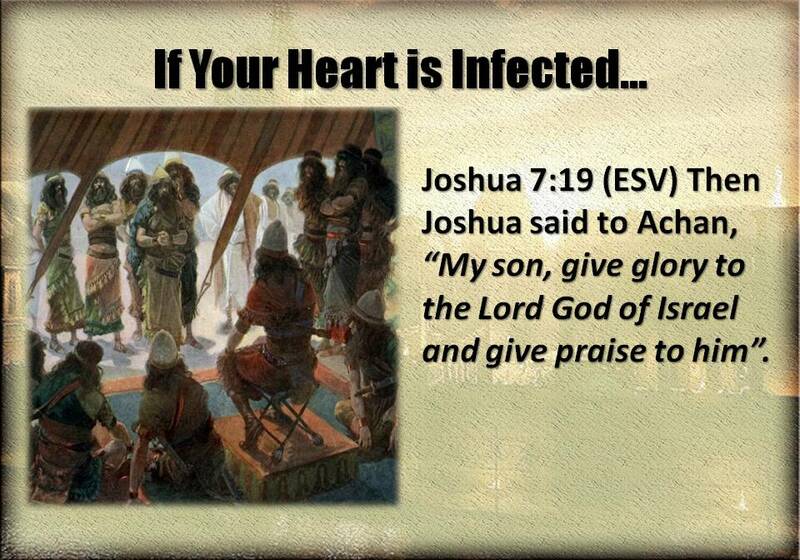 To counter the effects of the Babylonian Garment, Joshua told Achan to give glory to the Lord God! When we do what we want, when we go our own way, when we place our confidence in splendor, status and success, we are robbing God of His Glory. God wants His people to give all praise and glory to Him. Everything in our live depends upon God! 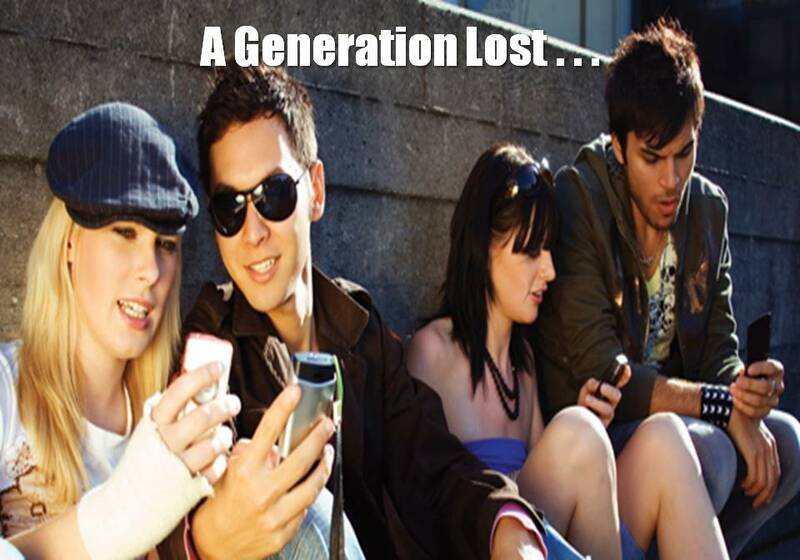 The Millennial Generation or Generation Y consists of young adults born after 1980. The latest research from Barna indicates that this generation is growing up without a Biblical Foundation of Jesus Christ. Only 15% of Millennials profess faith in Jesus Christ. Yet their parents, the Baby Boomers, profess a 65% Christianity. 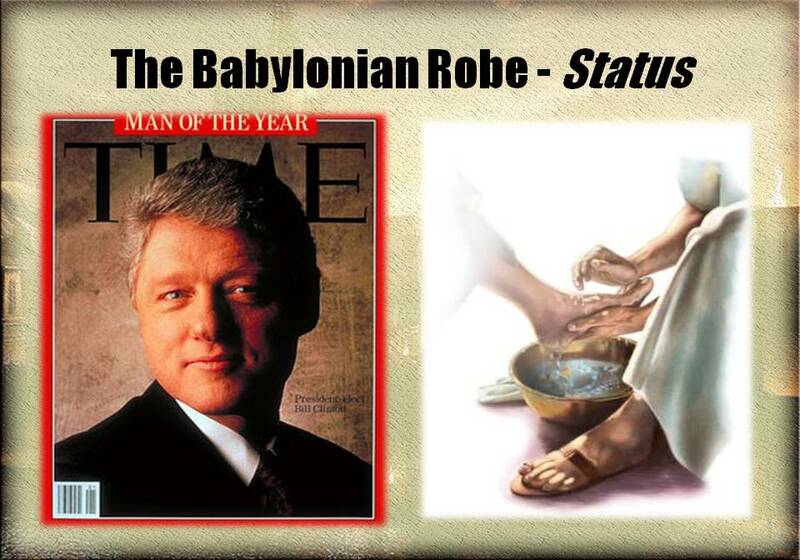 The Garment of Babylon is what happened. We have put on our Sunday Faces and Clothes at Church, but throughout the week we wear our Babylonian Garment. We pursue our splendor, our status and our success. We embrace the spirit of Babylon in our homes and work. We display a MINIMAL DEPENDENCE upon God in our homes, our work and our lives. We have danced with Cain, we have partied with Balaam and we have colluded with Korah. And so Babylon has infected the hearts of our families and children. Cain wanted to seek the God in his own way. He thought his splendor was good enough. Balaam was divided between pleasing God and having the status of the King’s Prophet. So he corrupted the message of God, and gained the status of the King, but lost his soul to the ways of Babylon. Korah wanted to make his own success, apart from Noah and God. He had enough of Moses, and told him, everyone is holy enough. He wanted to go his own way and be successful apart from Moses and God. Give Glory to God in everything, Seek His Glory through Everything and most importantly, allow our lives to display His Glory to those around us! 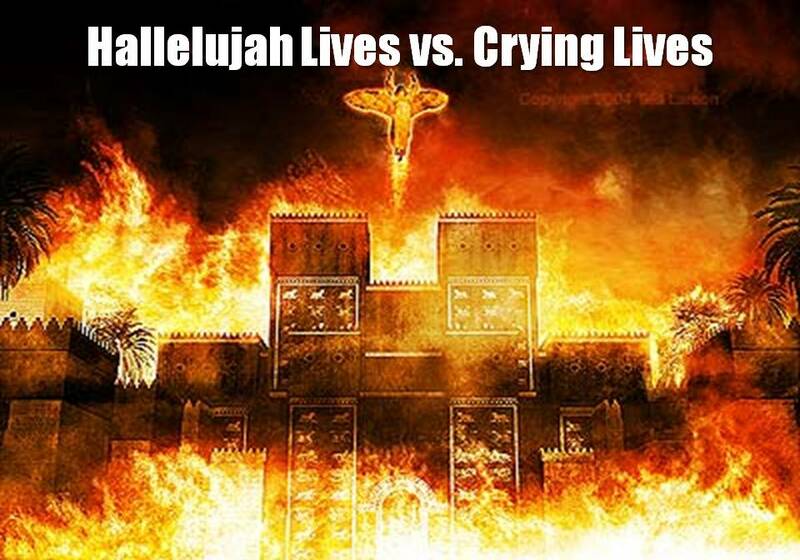 We Can Live Hallelujah Lives or Crying Lives! The World cried at the downfall of Babylon. It had become their life! Those Saints in Heaven Shouted Hallelujah! When we seek satisfaction in the Splendor, Status and Success of this world, we will end up miserable, dissatisfied, on medication for depression. Or you will come to the Salvation that only Jesus Christ offers, accept the misery of sin, and fall into the Love and Hope that Jesus Christ alone offers. Jim, you are the most wretched and hopeless man, and in yourself you will never be anything else. But I have looked upon you through your faith in My Son as though you never sinned at all. I chose to see you in my Son by your faith! Glory! God alone is worthy of Glory! My Joy, my happiness, my accomplishments are all in Him! What Does that Babylonian Garment offer me that could even compare? It is temporary, it is fading, it will be soon eaten or destroyed or lost! We need to embrace Christ with our children. We need to quit putting emphasis on the Babylonian Lifestyle of self effort and success, and focus on the splendor, the standing and the success that come from putting on the Lord Jesus Christ! Isaiah 43:7 says we are created for God’s Glory! Isaiah 48:9 says God will not give His glory to another. So God did not create us so that He would become more glorious, for His beauty and perfection are complete. He is already Glory defined. God cannot become more God by making something that is not God. No, God created us to display His Glory! This world is to KNOW God’s Glory by our lives! We are not to seek our own glory through splendor, status or success. No, in all our lives we are to display God’s glory to the world, not our own glory! Babylon is man-centeredness. It can be in our churches, our worship, our work, our families, our lives. God will give His glory to no one. We cannot make God more glorious by accumulating stuff and bringing it to Him. But we can bring our lives and all we have to HIM and ask Him to use it to bring glory to Him. Never hold on to stuff if it starts to become more important than God or worshipping Him! We are to display God’s Glory to the world with all our lives, with all our being, with all our STUFF! “The upcoming G20 meeting in London, England will likely result in the failure of all nations to agree on anything on a unified basis, which will trigger major market declines in the weeks to follow. Investors should get out of equities and bonds and into precious metals or cash (not U.S.!) exclusively. This next wave of financial mayhem will also catalyze elevated levels of civil unrest where unemployment is highest and where food shortages will soon begin to underscore how serious the crumbling global infrastructure really is. Governments throughout the G20 will likely react by protecting domestic supplies of energy and food as public pressure to solve the problems forces governments to act according to popular sentiment. Organized crime groups such as drug cartels and bankers will take advantage of the growing chaos to perpetrate their own interests to the detriment of (mostly) urban centers. God will use the lawlessness that is simmering to set the stage for the lawless one to be revealed. He will come forth to bring peace to a world in financial and political chaos. He will offer the solution that will result in renewed financial stability and prosperity, but only on his terms and with his control. He will have his roots in the Babylon whore spoken of in Revelation. But we know her end.